The InterContinental San Francisco Hotel, a graceful tower of translucent cool-blue, soars 32 stories above the vibrant South of Market (SoMa) neighborhood of San Francisco, and has quickly taken its place among the city’s most admired landmarks. 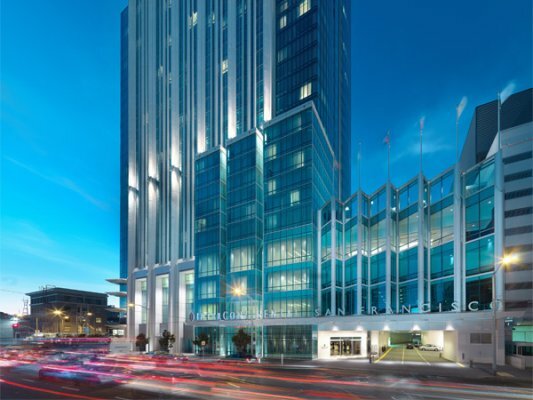 Located directly adjacent to the Moscone West Convention Center, the InterContinental San Francisco occupies a strategic location for both business and leisure in America’s most dynamic and beloved city. 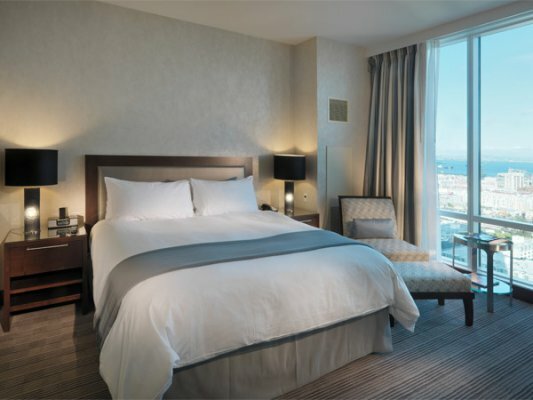 While its convenience for businesspersons is unrivaled, San Francisco’s newest luxury hotel is also within easy walking distance of Union Square, premium shopping areas, a diverse collection of trendy and upscale restaurants and bars, and a number of major San Francisco tourist attractions. 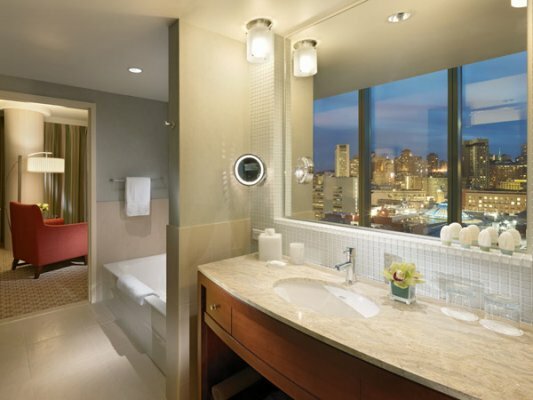 The InterContinental San Francisco Hotel offers 550 guest rooms (all non-smoking), including 14 suites featuring a spectacular duplex Presidential Suite with unrivaled city skyline and San Francisco Bay views. The hotel has an intimate footprint with only 22 guest rooms per floor. 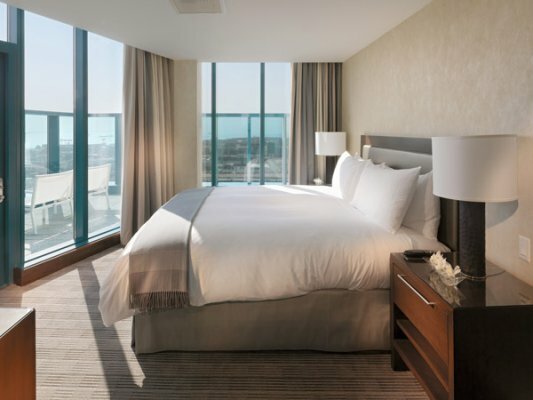 Rooms are luxurious and elegantly appointed with rich wood and marble, striking contemporary art, sleek, stylish furniture, and the latest high-tech amenities. 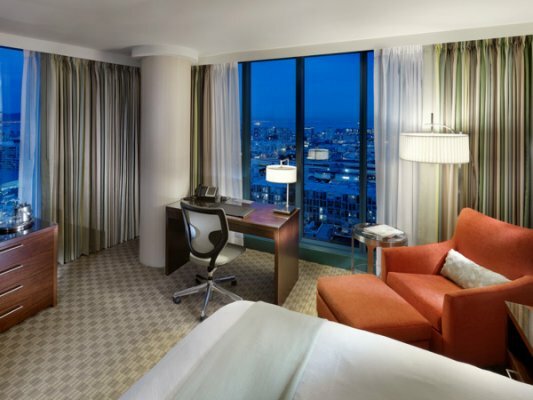 All of this is enhanced by floor-to-ceiling windows through which spectacular city and bay views add to a wondrous experience in San Francisco. Establishing new standards for design, luxury, amenities, and commitment to guest satisfaction, the InterContinental San Francisco hotel features a 10-room spa offering a comprehensive array of exquisite treatments and signature experiences, staffed by a team of therapists skilled at graciously pampering guests. 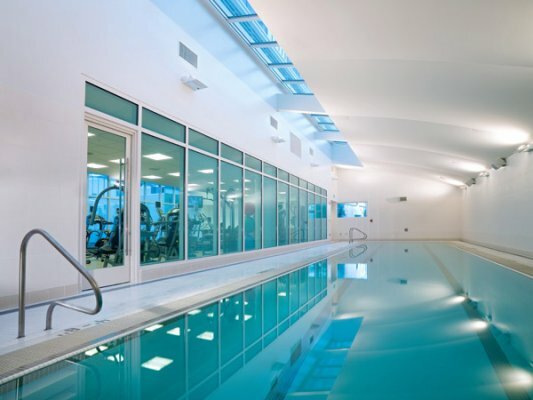 For a more vigorous workout, guests can enjoy the indoor heated lap-pool or fitness center right next door to the hotel. Wonderful dining experiences await our guests at Michelin-starred Luce Restaurant offering American- style breakfast and lunch and transforming into a destination wine restaurant for dinner. 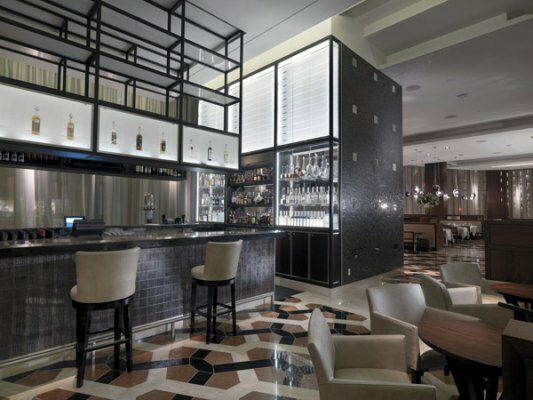 Enjoy a tantalizing Grappa cocktail at Bar 888 located on our lobby level. The Hotel’s 43,000 square feet of meeting and function space includes 2 spectacular ballrooms and 21 meeting rooms on the 3rd, 4th and 5th floors, where flexible configurations provide for events requiring 400 to 1,600 square feet. The hotel’s conference and banquet facilities all have natural light and are the most technologically advanced of all San Francisco meeting venues, equipped with capabilities for high-speed Internet access, ISDN lines, independent climate controls, and advanced security. 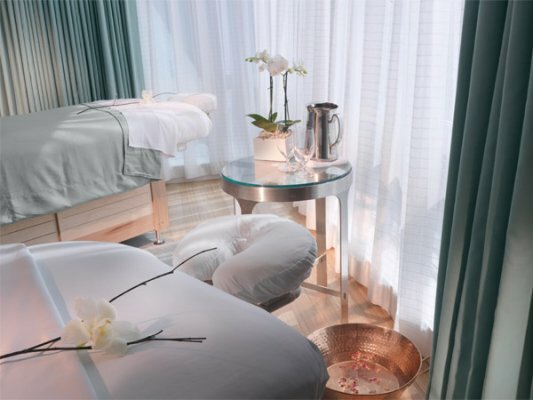 We INVITE you to pamper yourself at our Spa, San Francisco’s most luxurious new spa. Create a personalized massage with our essential oils blending bar or receive a unique facial with a customized combination of MURAD skin products. Treat yourself to an Spa Package deal and let us create a few hours, or a whole day, or a weekend of transformative pampering. Whatever you choose, know that we strive to create a spa experience that is completely personalized. Because at our Spa in San Francisco, it truly is all about you. Experience your own personal spa journey with one of our signature spa treatment packages. Our staff can assist you with scheduling your spa services in any sequence you prefer and can schedule time for you to enjoy our exclusive spa cuisine while you relax on the spa terrace at InterContinental San Francisco. We recommend that you make your spa reservations well in advance of your arrival. Reservations can be made by calling the Spa Reception Desk at 415-616-6597 or hotel extension 6597. For guests that are not staying in the hotel, a credit card is required to secure your appointment. If you have any special physical or medical considerations, please notify the spa, so that we can best prepare for your treatment. Spa Gift Cards are available to purchase for any special occasion. Whether for an anniversary, birthday or holiday gift, a congratulations or thank you gift, what better way to say you care than with a gift from the Spa? Gift cards can be purchased in person, over the phone, or online. Spa Gift Cards are beautifully packaged, and can be used for spa services as well as in the InterContinental San Francisco spa boutique. The InterContinental San Francisco offers a state-of-the-art, 24-hour fitness and wellness center with qualified trainers. The 4,020 sq. 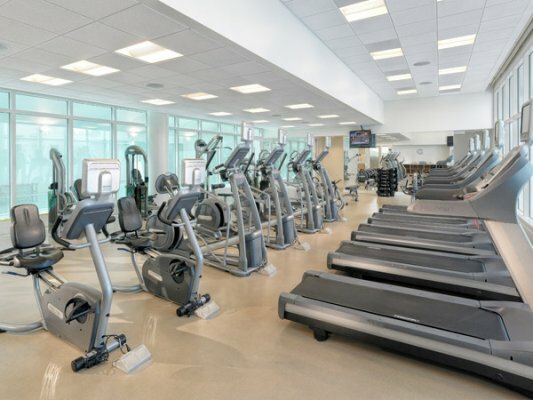 ft. facility offers the latest in cardio, Precor, and free-weights equipment, as well as additional areas to stretch. We also feature a Jacuzzi and indoor lap pool for your fitness needs while visiting San Francisco. 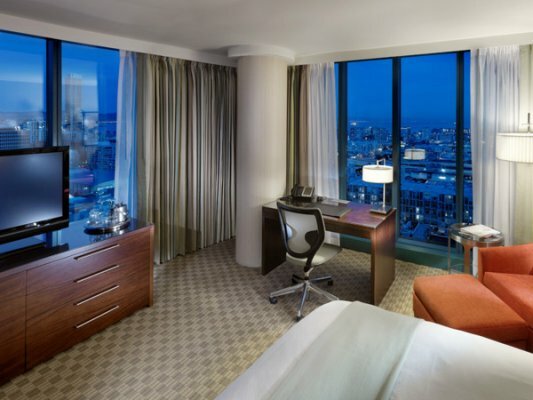 InterContinental San Francisco’s business center services are available 24-hours and is located on the hotel’s 3rd floor. The Business Center is a full service business center. Full services include copying, printing, fax, high speed internet and secretarial services. 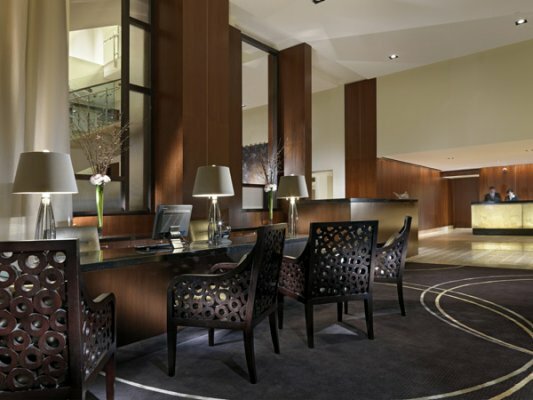 The InterContinental San Francisco offers 43,000 square feet of meeting and function space that includes 21 meeting rooms on the 3rd, 4th and 5th floors, where flexible configurations provide for events requiring 400 to 1,600 square feet. In addition, two spectacular ballrooms are designed to accommodate the most important business, cultural and political events in a city whose legendary civic energy demands the finest amenities. Both the 6,800-square- foot Grand Ballroom and 5,600-square- foot InterContinental Ballroom can be divided into three smaller rooms to host gatherings up to 1,000 people. The hotel’s conference and banquet facilities are the most technologically advanced in San Francisco, equipped with capabilities for high-speed Internet access, ISDN lines, independent climate controls, and advanced security. The wireless network has been upgraded from BG to BGN. BGN wireless connection is twice as fast on both upstream and downstream, and imporves coverage by more than 60 percent. A dedicated banquet kitchen staffed by a world-class culinary team ensures that food service for special events lives up to the standards that have long been associated with the InterContinental brand and San Francisco’\’s renowned dining scene. 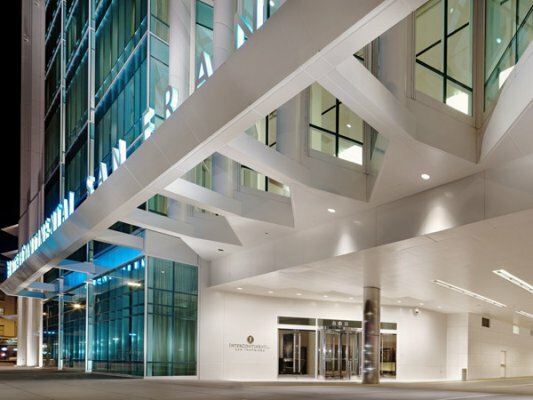 The meeting facilities and services at the hotel create an unrivaled synergy with Moscone Center, particularly during major national conventions. 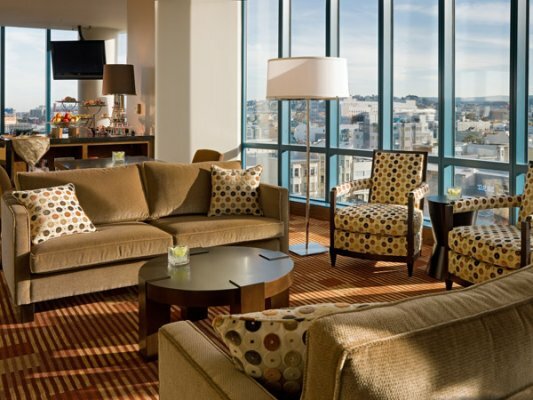 The InterContinental San Francisco is also committed to a proactive philanthropic policy, making it easier for selected non-profit organizations to hold conferences or fundraising events at the hotel without incurring excessive expenses. For your audio-visual needs, PSAV is the preferred vendor of the InterContinental San Francisco and can handle all of your meeting and event technology needs. Whether you’re producing an intimate meeting in the boardroom or an elaborate stage production in the ballroom, you want the peace of mind of knowing that you have the total support of your event technology partners – PSAV® your Partners in Show. Planning a wedding at InterContinental San Francisco means each moment of the day is tailored specifically to your needs. We will execute your vision down to the smallest detail or, if you prefer, our professional event planners are happy to take the lead in creating the wedding of your dreams. However you choose to plan your wedding, our staff will ensure that when your big day comes, you’ll be free to enjoy every moment of the happiest day of your life. 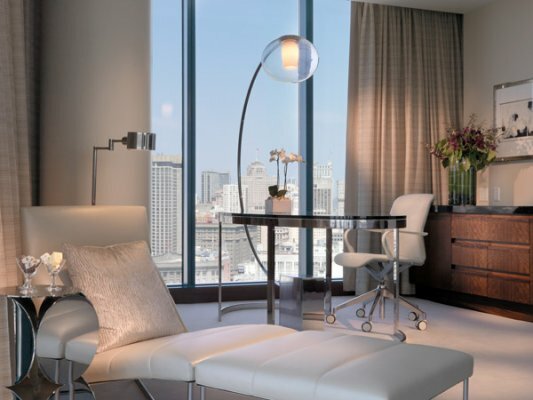 Accommodations at InterContinental San Francisco Hotel are modern through and through, both when it comes to look and feel, but also when it comes to amenities. 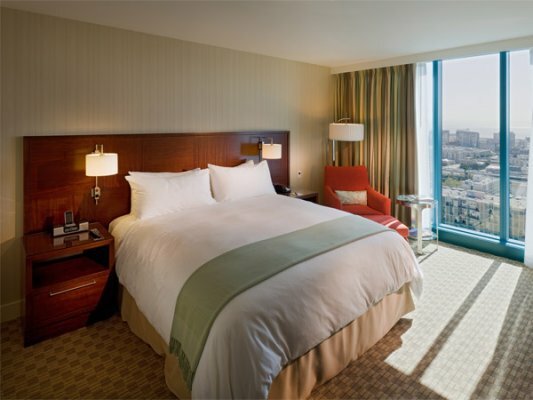 All 550 rooms are elegantly appointed with luxurious wood and marble and have large working areas, flat screen televisions, hi-speed and wifi internet and floor to ceiling windows affording spectacular views of the San Francisco skyline. In addition, hotel rooms are equipped with I-pod docking stations, robes, iron & ironing boards, in-room safes, coffee makers, private in-room bars and in-room climate controls. Decorated to reflect modern sophistication, the 14 top-of-the-line hotel Suites can perform as a perfect place to conduct business as well as a superior location for leisure time with family or friends. 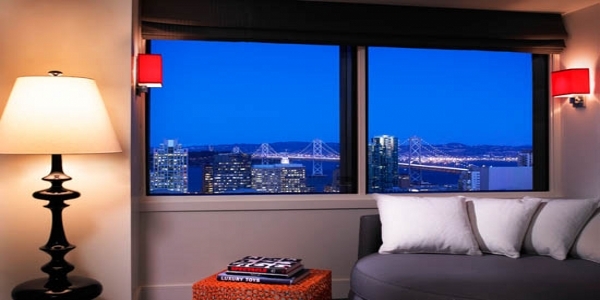 Each Suite has unparalleled views of San Francisco for a memorable stay in the City by the Bay. The 2,000- square- foot Presidential Suite is on two floors and has two outside terraces as well as a combined dining and living room area. The Master Bedroom offers sweeping views and has two Master bathrooms, one featuring a Jacuzzi tub as well as a walk-in closet. 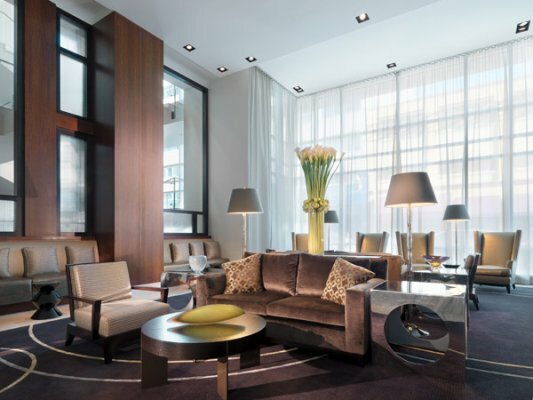 Our luxurious suites are located on the Top Floors of the Hotel. 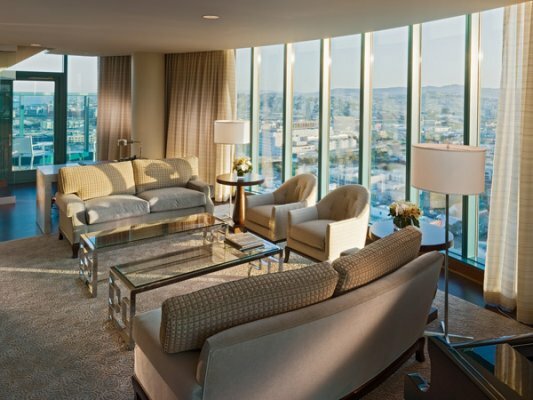 Each suite includes floor to ceiling windows which let in breathtaking views of San Francisco, separate bedroom and parlor with separate shower and tub, warm contemporary decor including 42-inch HD televisions and iPod clock radios. Club Rooms are on the Top Floors of the hotel and offer marvelous views. The Club Lounge includes food served throughout the day, internet, and 2 items pressed daily. Deluxe Rooms are on higher floors, some with great views. 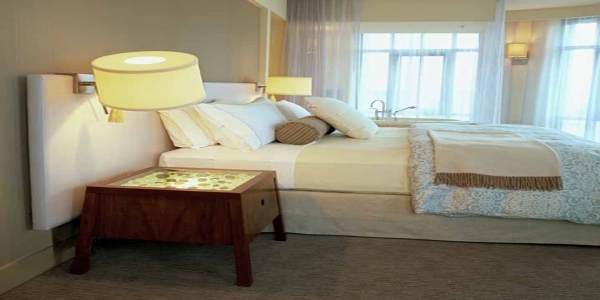 Deluxe Rooms do not include access to the Club Lounge or premium services. Our upscale and modern standard rooms have everything you need to have a relaxing and worry-free stay. Enjoy your favorite TV programs in full-HD on a modern flat-screen, or feel right at home with our many hotel amenities. 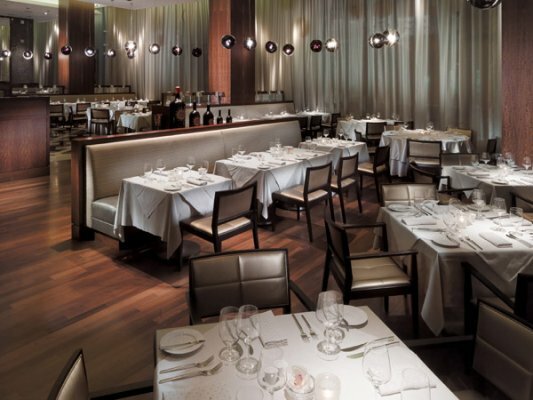 Awarded a Michelin star three years consecutively, Luce offers artisanal, New American cuisine with global influences. Since its opening in 2008, Luce has garnered numerous accolades including Esquire magazine’s “20 Best New Restaurants 2008”, Robb Report magazine’s “7 Best of the Best restaurants”. and Haute Living magazine’s “Top 5 Power Lunch Spots in San Francisco”. Luce features American-style breakfast and lunch and transforms in the evenings into a destination restaurant where the synergy between food and wine is unparalleled. An award-winning winelist offers a superb collection that encourages exploration and daring pairings. Enjoy a tantalizing cocktail at Bar 888 located on our lobby level. Grappa is the specialty of the house and we have found a new, unique way to mix this magical potion. 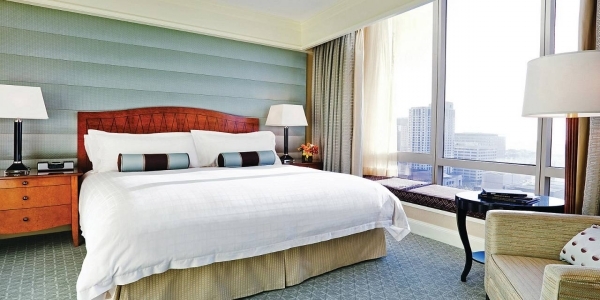 24 hour in-room dining is available at InterContinental San Francisco as well as a special Spa Menu from our Spa. Join us for LUCE’S CULINARY CLASH! benefitting the California Culinary Academy’s scholarship fund. Five California Culinary Academy students vie for top honors and a trip to New York. They design the menu, they cook the dishes. See whose culinary skills will prevail! Mon. Feb. 27 and Sun. Mar. 4, 11, 18, 25. Three-course dinner at $40++ per person. Reservations highly recommended. Awarded a Michelin star three years consecutively, Luce, meaning “light” in Italian and pronounced LOO-chay, is an establishment at which a talented, passionate staff collaborates to make every guest’s dining experience highly memorable. This is also a restaurant that strikes a perfect balance between food and wine in an environment that presents a sense of elegance without overindulgence. Reflecting the bounty of San Francisco Bay Area’s surrounding farms, the menu changes according to freshness and seasonality. The ingredient-driven cuisine combines contemporary American fare with influences from around the world and focuses on key flavors and different textures. 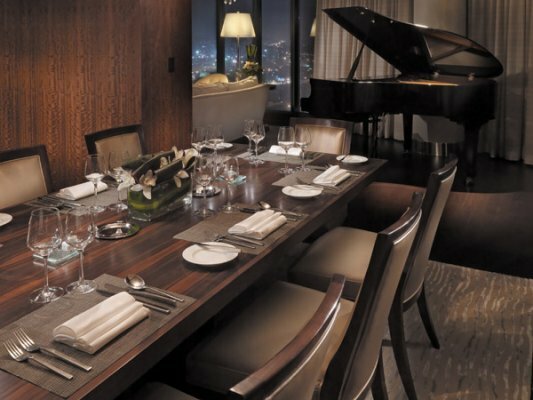 Luce has garnered a mulititude of accolades including recognition as one of the Best New Restaurants 2008 by Esquire Magazine, one of seven Best Restaurants for 2009 by the Robb Report, and one of the Top 5 Power Lunch Spots by Haute Living Magazine in October of 2010. Luce has proudly earned a Michelin star for 2010, 2011 and 2012. Luce is open for breakfast, lunch, and dinner daily, Brunch is offered on Saturdays and Sundays. A private dining room, ideal for family celebrations or business meetings that demand style, seats 14 in comfort. At Bar 888, InterContinental San Francisco celebrates one of the best traditional drinks of Italy. Here, the famous grappa comes out of the shadows and stars as the main attraction with tantalizing cocktails and fabulous elixirs. It’s this unique tradition that ranks Bar 888 among the best bars in San Francisco. Grappa is a fragrant, grape-based pomace brandy of between 30% and 80% alcohol by volume (60 to 160 proof), of Italian origin. Literally “grape stalk,”, grappa is made by distilling pomace, grape residue (mainly the skins, but also stems and seeds) left over from winemaking after pressing. It was originally made to prevent waste by using leftovers at the end of the wine season. Grappa quickly became commercialized, mass-produced, and sold worldwide. The flavor of grappa, like that of wine, depends on the type and quality of the grape used as well the specifics of the distillation process. In Italy, grappa is primarily served as a “digestivo” or after-dinner drink. Its main purpose was to aid in the digestion of heavy meals. Grappa may also be added to espresso coffee to create a caffé corretto, meaning corrected coffee. Another variation of this is the “ammazza caffé” (literally, “coffee-killer”): the espresso is drunk first, followed by a few ounces of grappa served in its own glass. In the Veneto, there is rasentin: after finishing a cup of espresso with sugar, a few drops of grappa are poured into the nearly empty cup and swirled, and drunk down in one sip.